The first of three workshops sponsored by AIPS and the Inter University Social Science Consortium was led by Dr. J. Mark Kenoyer from the University of Wisconsin-Madison with the assistance of the AIPS Director, Nadeem Akbar and his staff. The workshop was held for five days, from February 2-6, 2015. The workshop was attended by 15 faculty (6 women and 9 men) from universities in Balochistan, Gilgit/Baltistan, Khyber Pakhtunkhwa, Punjab and Sindh. The goal of the workshop was to strengthen the teaching of archaeology and cultural heritage in Pakistani Universities through the development of appropriate teaching pedagogy and goals. The first session focused on the discussion of “pedagogy” and “Teaching Philosophy statements” as well as the ways to get students to think critically and creatively. Other topics of discussion included the History of Archaeology and its development in South Asia, how to teach archaeology and cultural heritage in the context of Islamic precepts, and the relevance of archaeology in the modern world. In the second session, the major theoretical frameworks used in contemporary archaeology were presented and participants learned the basic steps needed to develop their own theoretical approaches. The rest of this session focused on developing teaching resources for courses on ancient technology and craft specialization, cultural heritage management, as well as database management for documenting and sharing data between scholars and between universities. Participants were provided a copy of the South Asian Archaeology Gazetteer that has been developed by Dr. Randall Law in collaboration with Dr. Kenoyer and other scholars in Pakistan and India. This is an online mapping tool linked to GoogleEarth, which allows teachers to show students where sites are located and to provide an overview of surveyed regions in Pakistan and India. All of the participants were excited to start using this tool to aid in teaching and research. The third session was graciously hosted by Dr. Muhammad Ashraf Khan, Chair of the Taxila Institute for Asian Civilizations at Quaid-i-Azam University. This session involved active participation and observation in traditional technologies in the context of experimental replication of pottery, beads, sculpture and textiles. The fourth session was held at the World Heritage Site of Taxila where excavations were being carried out at Bhamala Stupa under the direction of Dr. Abdul Samad (Director General, KPK Department of Archaeology) and Abdul Hamid Chitrali (Hazara University, Department of Archaeology). This field trip was to expose the participants to an active excavation and conservation site. Each of them was asked to develop a site development and conservation proposal for developing the site for tourism and for conserving the remains in a manner that is consistent with UNESCO standards. The fifth and final day of the workshop focused on assessment issues and evaluation of their own teaching methods as well as the effectiveness of the workshop that had just been completed. Each of the participants was asked to write up a short statement of what they learned and what they thought they could implement at their home institution upon their return. They were also asked to think of longer-term goals for developing shared resources for teaching archaeology and cultural heritage that could be hosted on their department websites and accessed by other colleagues in Pakistan or other regions of the world. Based on the positive emails from the participants and their postings on social media, it appears that the first workshop was quite successful. The next two workshops will be held later in the year, but Dr. Katie Lindstrom (UW-Madison) and Dr. Uzma Rizvi (Pratt Institute, NY). AIPS sponsored workshop “Teaching Archaeology and Cultural Heritage Management” led by Mark Kenoyer, February 2-6, 2015, Bhamala Stupa. 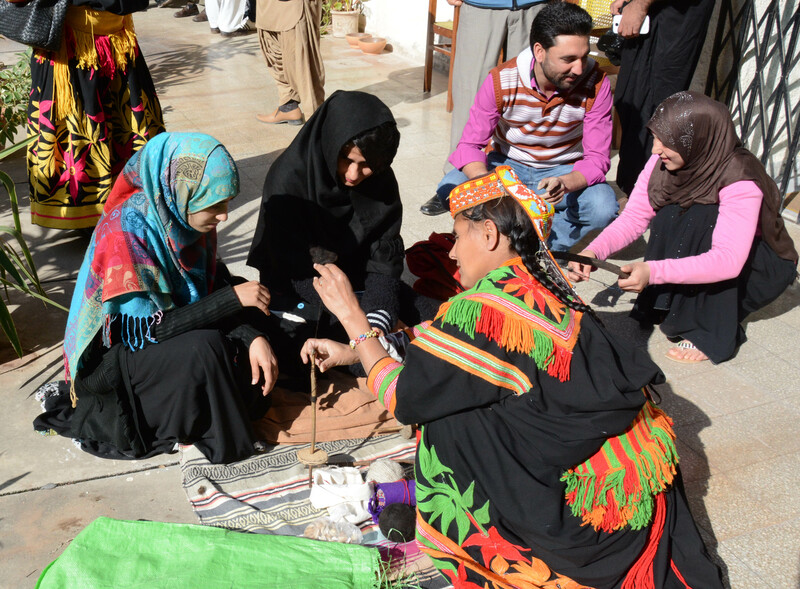 A pottery demonstration at the workshop “Teaching Archaeology and Cultural Heritage Management” led by Mark Kenoyer, February 2-6, 2015, Quaid-i-Azam University.